Maril Crabtree is a writer, a teacher, and a healer. Her work has been published in many venues. To have a fuller appreciation of her talents, visit http://www.marilcrabtree.com. You can also find Maril on Facebook. On September 11, 2001 the world stopped for America. As horrendous as those next days were, I was aware of curious sense of relief. Finally I realized that I was relieved because everything had slowed down. Many of my normal activities and events were canceled; nobody was expected to “carry on.” We all had permission to simply stop, stop and mourn, stop and feel the fear, the anger, the concern. Suddenly I had not only a reason to pray and meditate, but lots of time in which to do so. The events of that one day cleared my calendar and cleared my heart and mind from its usual state of busy-ness. We surrendered our day-to-day plans for a different kind of reality. The word “surrender” evokes mixed feelings for most people. In this case we had to surrender to the unknown, to the present moment. We also surrendered – gave up – our ordinary notions of TIME and SPACE. 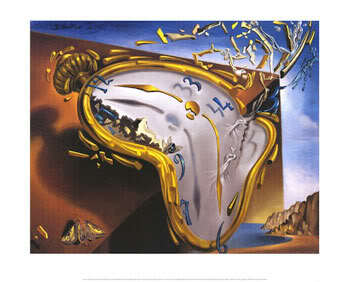 We allowed ourselves to enter what’s called “deep time” which is not measured with a clock. Time is fluid, not fixed. Deepak Chopra talks about being able to suspend time when you’re in meditation, or prayer, and simply engrossed in doing something you enjoy. The old phrases “time stood still” and “time flies when you’re having fun” apply here. Another thing to surrender is your own mind’s resistance to change, to getting out of your routine, to making space for something different. Replacing resistance with openness, curiosity, and enthusiasm is good for the soul. More and more research is confirming what the God of the ancient Jews proclaimed: the secret of eternal life lies in finding peace for ourselves in the midst of a busy world, creating that space in which we can, without fear or hesitation, surrender to the unknown, to the present moment. Cancer research has identified things that decrease the stress response and open our bodies to healing— and they are things like laughter, doodling, puttering. One study researched the effects of drumming and found that joyful drumming, letting go and enjoying yourself while banging away on a drum, was the most effective way to reduce stress. Once again we see the value of maintaining a childlike attitude towards the world, an attitude that pays attention to what is going on in the moment – and isn’t lost in worry over the future or regret about the past. When we surrender our ordinary ways of doing things, we create space, emptiness, room for something else to come in. Thanks, Kay. hope you are well and happy. I have always loved your writings. Was looking at your poetry and water books the other day. Hope you are well. Namaste. How great to cross paths with you again. Your reflection on the ancient Jewish admonition to find space in our busy day to surrender to the moment is a good reminder for me. How often have I confirmed another woman’s inner urging to just take a short nap…without offering an apology or even a “reason”. Just because the rainy day drags on, I skipped making the bed earlier or maybe…because I can. Valorie, good to hear from you – hope our paths cross again!